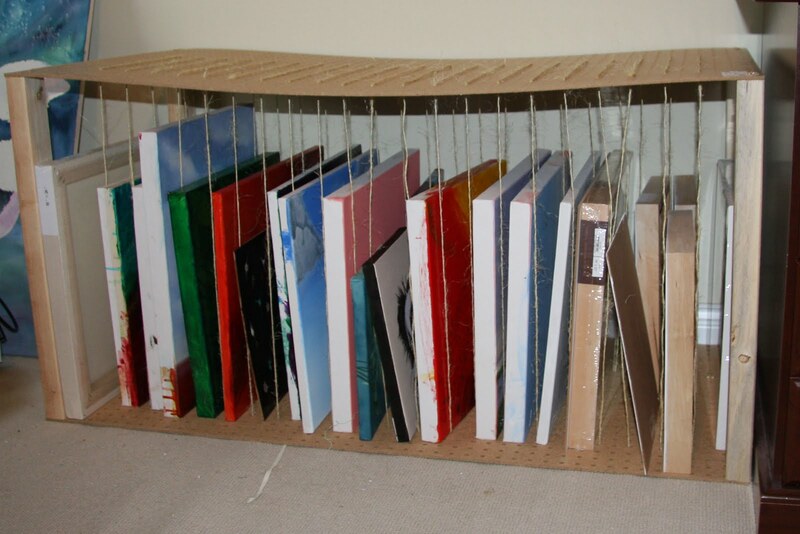 In the effort to get my studio organized (again) I needed to come up with a solution for my growing number of canvases and panels that have been cluttering up every inch of my studio. I have seen several different options ranging from reasonably priced to ridiculously expensive. 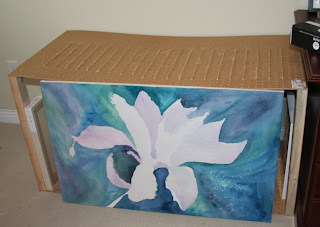 I thought I would see if I can come up with a system that I can make with limited power tools, I can not be trusted with power tools... and that I can make by myself so I am not waiting on anyone, I won't mention any names. I also did not want it to be too tall as I want to keep the wall space free to hang finished works from my gallery wall again once I rewire it...that is another story! 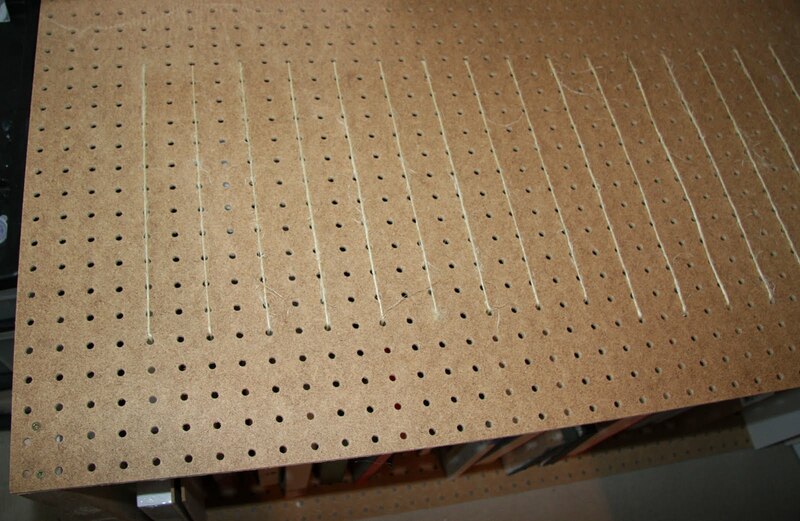 So off to Home Depot I went and picked up a sheet of 1/8" 2x4" pegboard. In hindsight, I probably should have gotten a 1/2" as it would have been sturdier but I can reinforce if needed. I had them cut it in half as most of my canvases and panels are not larger 22" wide. I bought a 2x4" and cut into 4 equal pieces to act as the legs. Home Depot has a cutting area with a hand saw and metal beam type cutting area so it was pretty quick & easy to cut on the spot. 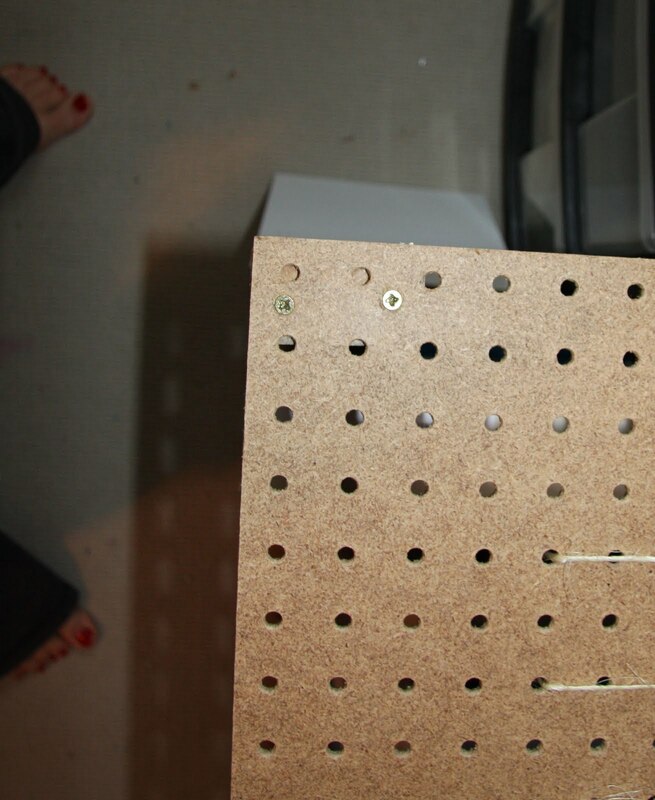 When I got home I pre-drilled holes in the 2x4" and screwed them into each corner with a screw gun. Then I used some acid free twine and pulled it through every other hole about 4 holes from the outer edge to create a support for the panels to rest upon. I have seen artists online use dowels rather than twine which would also increase the sturdiness but each dowel would need to be cut to fit. I would have to use a hand saw as table saws scare the bigeezes out of me. I seriously have to leave the yard when my hubby uses one. I think it is the curse of being an artist, overactive imagination combined with overly detailed mental images, ugh. 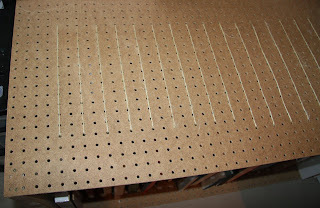 So I figured, go with the cheaper saw-free twine and if I am not happy with it then go to plan "B" of the dowels. I tied a loop on one end then slid a bobbie pin through the loop to act as a needle. This made going through each hole super easy and was able to just keep pulling every few inches to space out the twine properly until the end. I should have taken a photo of the bottom side as well but I just across two holes rather than vertically. But I am happy to say the twine worked out very nicely. 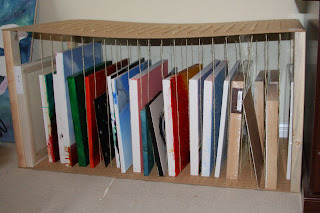 I will add a few additional 2x4" posts to make the rack sturdier so that the top is flat and can support heavier items on the top. I should have taken a before photo of my studio to show how much space these canvases took up before as they used up every free inch of wall that I could lean them against, so much nicer now! 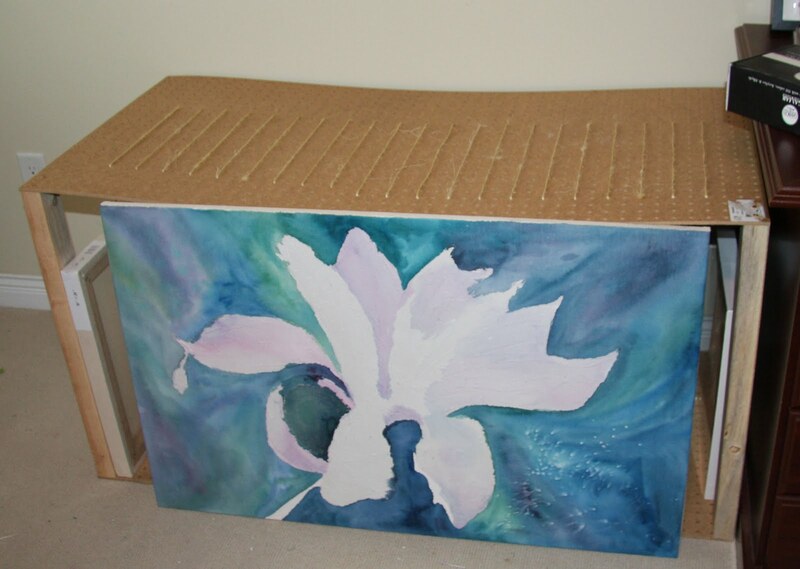 I put one of my unfinished paintings in front to hide the canvases. I started this at an acrylic workshop over a year ago and now that it is front and center in my studio, maybe it will get finished. can get expensive and you've come up with a pretty good alternate!